Like many people, I was having breakfast this morning when the news that David Bowie had died flashed up as breaking news on the different digital devices dotted around the flat. I couldn't believe it. How could it happen now? It was only last Tuesday that I'd heard John Wilson talking about the new Bowie album Blackstar on BBC Radio's Front Row. At the time I'd made a mental note to listen to the album when it was released on Friday 8th January to coincide with the singer's 69th birthday. Then, after I'd listened to it, I remember thinking that it needed a closer listen. So early on Saturday morning I lay in bed with headphones on, listening to the whole album. And for the rest of the weekend I had the songs spinning round in my head, especially Blackstar, Lazarus, and I Can't Give Everything Away. And now I'm being told that he's dead? It sounds like a hoax. But then the one line news alerts start to get longer and more detailed and it becomes clear that it isn't a hoax - it's real. I wrote to my friend John Howlett and said how Bowie had always had impeccable timing - leaving an album for his fans and then dying a couple of days later. In one statement I read, Brian Eno, who had worked with Bowie many times over the years, said: "David's death came as a complete surprise, as did nearly everything else about him." How true. My friend John replied to my message saying 'You’re the first person who came into my mind when I heard about Bowie.' It's hard to say just how much influence Bowie had on me over the years. I remember being told to listen to Hunky Dory when it first came out in 1971 and loving it. And I can still remember seeing the cover of the Ziggy Stardust album in the shop window of an Edinburgh record shop and thinking this was something totally new and different. I went to the Ziggy Stardust concert in Edinburgh and immediately started writing songs that sounded a bit too much like wannabe Bowie songs. Another friend asked me today if I'd ever met him. I wish I had. I went to mime classes with Lindsay Kemp and sold tickets for his Turquoise Pantomime on the High Street in Edinburgh. Bowie had studied mime with him. I was introduced to the songs of Jacques Brel and Kurt Weill and fell in love with them as Bowie had done. I read William S. Burroughs and loved the idea of cutting up and re-assembling song lyrics as Bowie often did. And I loved songs that were theatrical. I'm sure we would've found something to talk about. Bowie also appeared on the pages of iT's for Teachers magazine in various classroom activities and on the cover of one of the final issues coinciding with the 2013 exhibition David Bowie Is at the V&A in London. Tony Visconti, Bowie's longtime producer wrote today: "He always did what he wanted to do. And he wanted to do it his way and he wanted to do it the best way. His death was not different from his life — a work of Art. He made Blackstar for us, his parting gift." When a singer dies we usually have old songs going round in our heads. There aren't many artists who can fill your head with new songs just hours before they pass away. For various reasons (including one of those landmark birthdays that come round from time to time), this summer I ended up with a brand new 12-string Ovation guitar, a new microphone, two rather nice monitor speakers and a couple of audio interfaces to be able to connect everything to my computer and iPad to record some new music. It's a long way from the two-track reel-to-reel tape recorders I used when I first started writing songs, adding harmonies by bouncing from track to track. The array of sounds and effects on GarageBand and Cubase helped to make my first musical attempts both exciting and overwhelming at the same time. The first two pieces of music I came up with were a song that I'mstill writing lyrics for and 'We're Almost There' which isn't really a song at all. After I added the line 'Wake up. We're almost there' and the sound effects of the cars passing on the motorway, I remembered a video I made in Mexico City. The trip to Mexico was part of the research we did for Beyond. We visited a lot of schools there and met some amazing teachers. Most of the schools were out of the city and we spent hours driving from place to place. I thought the network of roads in and out of Mexico City werespectacular with its two levels. It reminded me of an old Tractorial Base song called 'Underneath the Overpass'. Anyway, I made a couple of quick videos in order to keep a record of it. I tried setting 'We're Almost There' to the video and it fitted almost perfectly. One of the great things about the Innovate ELT conference in Barcelona last weekend was the group work. At the start of the conference we were assigned a group and a room for the group to meet in. Having to spend part of the time completing tasks in groups gave everyone the chance to get to know other people they probably wouldn’t have spoken to otherwise and share the conference experience. In one of the final group sessions, conference speakers went from group to group, answering questions about the talks they’d given or anything the group members wanted to ask. As I went from room to room, it was interesting to see how the different groups wanted to talk about different things. I was asked about writing material, self-publishing, the story of iT’s and whether or not it was true that I’d once been a rock star. Another group asked me about using songs in class. ‘What’s the best way to use a song?’ they asked. I remembered that I’d once written a piece about using songs for the magazine so I promised to include it here. Here are 20 different things you can do with a song in class. Next time you want to use a song, choose the task you think suits it best. I’ve used some lyrics from the first verse of a song called 'Pepe’s Song'. Please note that this song includes references to crime and drug use. Check to make sure the themes are appropriate for your students before using it. You’ll find a link to download the song and a lesson below. You can also listen to the song here and read the complete lyrics here. 1. Take out the verbs and list them at one side. The students then put them into the correct place and correct tense. Or remove some of the more interesting vocabulary and encourage students to speculate on what the missing words are. Then listen to the song. 2. Make two copies of the lyrics and create an information gap activity. Student A has the text: "Pepe emptied his __________ ". Student A has to ask student B "What did Pepe empty?" to complete the text. Student B then has a missing word to find etc. Then listen to the song. 3. Before showing the complete text to the other students, choose 6 or 7 words from the lyrics and write them on the board: Pepe, pockets, money, station, never, home etc. The other students then speculate about what the song is about. Give them the whole text with the 7 words missing. Can the students place them correctly? Then listen to the song. 4. If the song has a strong story, cut up the verses (or the lines in a verse) and ask the students to put them into the correct order. Students then check the order by listening to the song. 5. Cut the text down the middle. Leave the first halves of lines as they are but jumble the second halves. Students have to match the half lines and build the complete text. They check their work with the song. 6. Ask the students to translate the lyrics into their own language. This works particularly well with songs that have bad lyrics! When the translation's done, play the song. 7. Write comprehension questions using the song lyrics as you would use any piece of text. Where was Pepe standing? On the station concourse etc. Finally, listen to the song. 8. If the song contains a lot of obscure vocabulary then create a dictionary activity. Remove the obscure words and write a sentence for each word. Half of your sentences use the words correctly and half incorrectly. The students use dictionaries to find out whether or not the sentences are correct. They also discover the meaning of the words which they will be able to place in the text. Finally, listen to the song. 9. If you don't want to use the song lyrics then there is often other reading material you can use that is linked to the theme of the song or the artist. Play the song while they are doing the work. 10. If the song tells a story then ask the students to predict what happens next or what happened before. Why does Pepe want to leave home? 11. If the song includes an interesting situation you can role play a scene from the song or use the other students' speculations (see 10) as the starting point for a role play. 12. Perhaps there's a writing link in the song such as a letter. In this case maybe Pepe left a note for his parents at home. The other students can write the note. 13. Your students can write about the artist or the theme of the song. They can also write a blog post or tweet about the artist. In both these cases, the song is an excuse for other work. 14. If you're very lucky then you might be able to use the song to look at some specific language. Songs are a good way to learn new or difficult language because they stick in the mind and are not easy to forget. 15. Use the song to start or end a discussion a discussion on a particular theme. In this song there are lots of themes to talk about. Maybe there's a song related to something you're working on in the course book. 16. Song lyrics usually include rhyme. Copy the text and take out one of the rhyming words. Other students think of possibilities and check with the song. Or play the song, pausing the track before the rhyming word. The other students then speculate. 17. If there's a video for the song then maybe you can use it without doing any work on the actual song at all. Write visual questions for the others to answer during or after the video. 18. If the song has a video that isn’t well known, get the students to listen to the song and come up with an idea for a music video. They could create a storyboard for a video and then compare their ideas with the actual video. 19. Ask your students to react to the song. What do they think of it? Encourage students to ask each other what they like or don't like about the song. Don’t forget to give your own opinion. 20. A listening activity! Write 3 questions on the board based on the lyrics of the first verse. The other students listen to the first verse (they don't see the text) and answer the questions. Go through the song in stages and only listen to the whole song at the end. Finally, why not use the song for background music. Play it while you are doing some writing or group activity. Playing music while students are arriving for class or doing certain tasks is a great way to create a positive and relaxed atmosphere. When I first moved to Spain a long time ago, people would sometimes ask me what I missed most about life in the UK. I would usually say 'the radio'. Back in the mid-80s, the only UK-based station I could listen to in Spain was the BBC World Service which I never really liked much. I wanted the dramas, news programmes, documentaries and quiz shows from Radio 4 and the music from Radio 3. Of course things have changed since then. First came satellite TV which included UK radio stations and then came the Internet. Today, apart from being able to listen live to radio stations from around the world or use various catch-up services, I can subscribe to podcasts and have programmes automatically downloaded to my audio player to listen to whenever I want. Now, when people ask me what I miss most about life in the UK, I usually don't know what to say. All of which brings me (in a roundabout way) to Pop Culture Happy Hour, a podcast I regularly listen to. It doesn't come from the UK but from NPR (National Public Radio) in the US. According to its blog, NPR's entertainment and pop culture round-table podcast 'features spirited discussions of movies, books, television, and nostalgia.' The show is basically a group of people talking about fun things that I'm interested in. And each podcast ends with a segment called 'What's making us happy this week' in which the presenters talk about something that's making them happy that week - it could be a new album, a project they're working on or a sports event ... anything. I borrowed the question to ask the teachers at the IP Conference in Athens last weekend as part of a talk I gave on life skills: 'What's making you happy this week?' It's an example of the kind of question you could ask students when they come to class. You know how students often arrive to class in a bad mood because they've had a bad day or have a problem at home or have just argued with their best friend? Asking a question like this can help to make students aware that there are always reasons to feel good, even if they’re just small things. If you do something like this regularly, it not only makes your students feel better, they'll be more receptive in class. Positive thinking. At the talk, I let the teachers know what was making me happy this week... Many years ago I co-wrote a series of ELT songs for the Cambridge English Course with Jonathan Dykes. One of the songs was called Brighton in the Rain. The song practised the present perfect and there were two versions - one with all the lyrics and one with all the past participles removed. The students had to provide those past participles. The first line of the song was 'I've never been to Athens' and the music was a pastiche of a Greek folk song. Anyway, I've been singing that song for years and the first line had always been true for me. I'd never been to Athens - until going to the IP conference. So being in Athens was what was making me happy this week. A news story sparked off a debate last week. It all started with an item on the BBC Today radio programme in which presenter Jim Naughtie mentioned author guidelines that had been sent to an educational author by Oxford University Press. As the Daily Mail put it: 'Schoolbook authors have been told not to write about sausages or pigs for fear of causing offence'. The publisher (and many ELT authors) reacted with surprise. As Jane Harley, a primary publishing director at Oxford University Press, wrote in The Guardian: 'Given that our editorial guidelines that reference pigs and pork have been in place for as long as I can remember, little did I imagine that they would attract international headlines.' The fact is that if you are writing or publishing an educational book for a global audience then you have to be aware of certain issues that might be culturally sensitive. That's why it's always preferable to publish local editions of courses. Writing for a local market can be very liberating. I was reminded of this when I created a page at this website a few days ago for The Calendar, a newsletter that I edited for teachers of English in Eastern Spain back in the 1980s. Apart from including articles and information for teachers, The Calendar (which was published by International House Barcelona) provided teachers with activities that were up-to-date and that didn’t shy away from difficult topics. You have to remember that back then there was no Internet or satellite television, video was a novelty and the British newspapers usually arrived in Spain at least one day after their publication date. So topical activities were in demand. Looking back at those issues of The Calendar now, I wonder how we got away with some of the things we printed. Our “Alternative Dictionary” would never make it into a publication today without some heavy editing. In April 1987 we had a classroom activity on AIDS, and our “Acid House—The Lesson” issue in 1989 even got a mention in El País newspaper. When I started editing and publishing iT's for Teachers for a wider readership, I became more aware of what was and wasn't acceptable. I still managed to get it wrong on occasion with some choices of artwork. But it wasn't until we produced American editions of our student magazines iT's Magazine and BiTs in 2002 that I started to understand just how careful you have to be. In our very first American issue there was an authentic text that included a reference to an adult taking a bottle of champagne from a fridge. I received an angry letter from a High School principal in the United States accusing me of encouraging young people to drink alcohol. When I asked our distributor for more guidance, I was sent a list of things that could and couldn't be included in educational material. The document had been drawn up by a major ELT publisher and included the following: "Baseball caps should be worn facing forward. There should be no contact between wild animals and children. Animals in zoos should not be seen behind bars in cages. Settings should not include any religious buildings, symbols or individuals (rabbis, priests, etc.). Storylines should avoid religious overtones or holidays. There should be no references to the occult, magic, ghosts, witches, etc. Do not depict or include in storylines card playing, dice, drinking alcohol, smoking or weapons." We received the list as we were preparing our James Bond issue. As you can imagine, writing about James Bond without mentioning weapons or alcohol was quite a challenge. We ended up with two Bond covers (see above). The first showed the Bond silhouette with his trademark gun. The American issue had Bond without his gun. As a result of our US experience we felt confident that we could create a magazine that could be used by students in almost any country around the world and soon afterwards we were asked to create Class Out for British Council students around the world. As far as I remember, we only had one problem with a map of the world that didn't get past customs in one particular country. Although it can be frustrating at times when you're told that a particular idea or piece of artwork won't be acceptable in a certain territory, writing material for a global audience can be tremendously rewarding. And being aware of what is and isn't offensive to people is an extremely useful life skill. Having said that, there's still space to do something alternative from time to time. Although English for the Zombie Apocalypse might not be the best resource for teachers in some countries, hopefully it'll be a hit with teachers and their students in other countries. On Wednesday this week I gave a webinar as part of the 2014 Macmillan Online Conference. The topic was ‘using multimedia in the classroom’ which is one of those themes that could easily fill a whole week of webinars. While I was doing some research, I came across two surveys that served as an introduction to the theme. The first was a survey carried out by Ofcom, the independent communications regulator in the UK. Ofcom carries out research to help understand people’s awareness of technology and communications. In August this year it published the results of a survey to find out how tech-savvy people are in the UK. It discovered that we’re at our most tech savvy between the ages of 14 – 15 years old. This seems to reinforce the belief that students know more about technology than their teachers. But do they really know how technology works or is their knowledge limited to carrying out the tasks they’re mainly interested in? For 12–15 year olds, more than 90% of their device time is message based (‘chatting’ on social networks or sending instant messages) while 10% of device time is spent sending video and photo messages, sharing or commenting on photos. That doesn’t leave much time for using their devices for other things. The results of the second survey were published in the journal Educational Technology Research and Development and reported on in Science Daily. The survey revealed that teachers still know better when it comes to using technology. The researchers looked at the technology skills of 24 science teachers and 1,078 middle school students from 18 different schools in two US states (middle school students are typically between the ages of 10–14). According to the survey, most students were not very familiar with information and communication technology or even Web 2.0 tools designed to make information production and sharing easier. They have little opportunity to practise technology beyond pursuing personal interests, such as entertainment. Their teachers, on the other hand, depended much more on using technology to solve daily problems, to improve productivity, and as learning aids. So it seems that teachers have a lot to teach their students about using technology to solve problems, enhance productivity, and develop creativity. This gives force to the case for using mobile phones and tablets in the classroom rather than banning them. If you were one of the 500+ teachers at the webinar, thanks for coming. It was good to see so many teachers with a positive attitude to using technology and multimedia in the classroom. 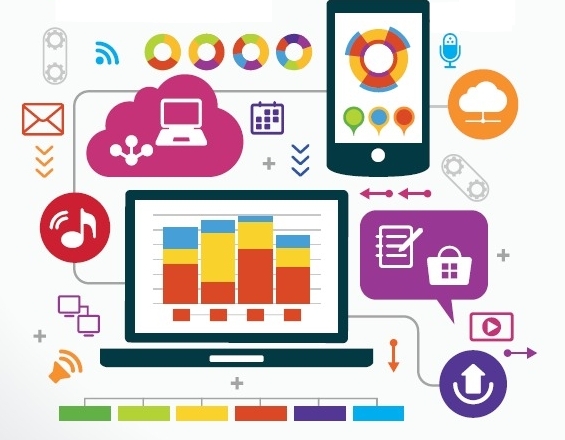 And if you want to try a simplified version of the Ofcom survey to find out how tech-savvy you (or your students) are then follow this link. I’ve added a new page to the site with information about some of the resource books that I’ve co-authored. The first title on the page is the latest – English for the Zombie Apocalypse which I co-wrote with Lindsay Clandfield. In the past, this would probably have ended up being an activity in the magazine but when Lindsay first told me about the idea, he managed to convince me that it could be more than just a magazine activity. We ended up with an eBook and audio download which we’ve just co-published through ExLT (Extreme Language Teaching). Each unit begins with an introductory activity that establishes a survival situation. Students are asked to make a decision based on the situation. Students then listen to a short scene to find out which decision the characters made in the same situation. Next, students follow a script of the scene and listen for missing information that will help them to answer a question. After listening and repeating key phrases from the scene, students prepare their own scene using the language and content of the unit to help them. The book also includes an 'A to Z of the Zombie Apocalypse'. It was a fun project to write and, after Lindsay tested it with a class of teenagers, we think it’s a fun project to teach. It’s the kind of book you can work through as a project or dip into when you feel like doing something different in class. You don’t come across many zombies in course books and zombies have never been as popular as they are now so we’re hoping the book will be popular. The other titles currently on the resource book page are titles from the iT’s English series of photocopiable activity books. These titles are currently out of print but it’s good to see them on the site especially with Derek Zinger’s cover designs looking so good. Follow this link to visit the resource book page. We went to see Guardians of the Galaxy on Friday. It was a fun movie with a lot of humour, some great visuals, and an amazing soundtrack. In fact, last week the soundtrack album reached number one in the Billboard 200. The album, which is called Awesome Mix Vol. 1 is a compilation of songs from the 1970s that includes Moonage Daydream by David Bowie and I Want You Back by The Jackson 5. At the start of the movie we see the hero Peter Quill as a boy listening to I'm not in Love by 10cc on his cassette player. It's one of the tracks on a cassette compilation that his mother gives him shortly before her death. Peter is then abducted and taken into space, growing up to become an interstellar adventurer also known as 'Star-Lord', still taking his cassette player and his mother's mix tape, labelled 'Awesome Mix Vol. 1', with him wherever he goes. The mix of retro music with a space adventure isn't new but it works so well here. The modern equivalent of the cassette mix is the playlist but somehow a digital playlist can't beat the fun and excitement of the other contemporary option - shuffle all. With a choice of around 8,000 tracks on my iPod from the past and present, from a wide range of genres, I'm always amazed at how tracks seemingly selected 'at random' can often fit together so well, creating a totally unique awesome mix. It happens often and is even more satisfying when one of my own songs appears sandwiched between David Bowie and Joni Mitchell! Of course, the shuffle option can get it very wrong at times and totally destroy the atmosphere you'd wanted to create. But that's part of the fun. The random option fits the times we live in so well when we tend to think in terms of tracks rather than albums even after artists have tried so hard to create 'an album' with the perfect running order of songs. In spite of having access to so much music online, I do wonder if young people today get to hear as wide a range of music as I did when I was growing up. The shuffle option can only really come into its own when it's shuffling a wide range of music from Mozart through Miles Davis to London Grammar and the theme from Thunderbirds. If it's simply shuffling a single genre then there isn't much scope for discovering how apparent opposites can work so well together. Each morning, after a first look at the Spanish newspaper, I download my daily UK newspaper and look at the First Night Reviews section. I think I do it partly to keep in touch with what's going on in the theatre in the UK and also out of habit. Back when I was trying to make a living writing music for plays in London, opening nights were special. They always started earlier than other performances so that the critics could get their reviews written before the next day's edition closed. This was in pre-internet, pre-computer days so we're talking typewriters and telephones. Then there'd be the long wait for the papers to appear on the newsstands. I'd buy all the papers and go through them, checking to see if there was a review and then checking to see if there was any mention of the music. I think the best review I ever got was from Jim Hiley writing about The Children´s Crusade in Time Out who wrote: 'And the music by singer/songwriter-to-watch Robert Campbell, is bloody marvellous'. And the worst review? Maybe Frank Marcus writing about Dean in The Sunday Telegraph: 'Robert Campbell will not cause sleepless nights to Stephen Sondheim'. Actually, there are other review for that show that hurt even more! The thing is, when you read theatre, film and TV reviews in newspapers, there are always positive and negative reviews. You expect it. You can agree or disagree with reviews but you know that the reviewer is giving their opinion. As an aside, you never know when theatre reviews are going to appear in Spanish newspapers. There doesn't seem to be a tradition of first night reviews and when reviews do finally appear, it's usually after the show's closed. Could there be a connection? Anyway, when I edited and published iT's for Teachers magazine, we had a regular book review section called First Impressions. The idea of the section was for a team of magazine contributors to give their first impressions of new ELT titles. I naively thought that this meant we could give positive and negative opinions, always stressing that they were first impressions and not in-depth critical reviews. Unfortunately, it was not to be. After we printed one particular negative review, it was implied that we were going to lose an important advertiser. For a small independent magazine, losing a major advertiser can be a major blow. So from then on, we decided that we'd only review titles we felt positive about. If we didn't like a book, we'd simply ignore it. There's a scene towards the end of Only Lovers Left Alive in which Adam (Tom Hiddleston) and Eve (Tilda Swinton) stand outside a bar in Tangier, listening to Yasmine Hamdan sing 'Hal'. Eve says she'll be famous one day to which Adam replies: 'She's too good to be famous.' or words to that effect. I've been waiting to see this Jim Jarmusch film since it was first shown at the Cannes film festival in 2013. It took its time getting to Barcelona. And when we did manage to sit down to watch it at the Floridablanca cinema, the projector decided to pack in. Ticket price returned, we tried again a few days later at the Verdi. Going to the cinema these days can be such a depressing experience when there are only a handful of you there. A couple of weeks ago we went to the Icaria cinema and there were plastic bags over broken seats and no-one noticed that the film had started without any picture. But I can't help it - I love going to the cinema. And watching Only Lovers Left Alive on a big screen in a near-empty session felt very appropriate. A bit like Adam and Eve driving down those desolate Detroit streets. Anyway, the film took me back to my early days in Barcelona when most of the V.O. films were shown at the Casablanca or Capsa cinemas (both now closed). Jim Jarmusch was so much a part of that period: Stranger Than Paradise (1984); Down by Law (1986); Mystery Train (1989). I think I saw them all at the Casablanca. I wasn't disappointed by Only Lovers Left Alive. The IMDB summary reads: 'A depressed musician reunites with his lover, though their romance - which has already endured several centuries - is disrupted by the arrival of uncontrollable younger sister.' How could I not love it? Tilda Swinton was the perfect vampire and Tom Hiddleston was great as the depressed musician. He reminded me of Mike Sheppard, bassist, guitar player, engineer, and third member of Tractorial Base. The egg boxes on the wall of Adam's room, the Revox reel-to-reel tapes turning, and the collection of guitars took me back to Steve's home studio in Shpeherd's Bush where we wrote and recorded most of the Tractorial Base demos. The egg boxes on the wall, the Revox and the collection of guitars took me back to Steve's home studio in Shpeherd's Bush. So I've added Welcome to Tractorial Base to the Tractorial Base album. It's really three songs linked together. It lasts more than 8 minutes but it'll give you an idea of how mad and exciting things were back then. The Sagrada Familia in 1928. Spot the tourist. There was an interesting article in El País newspaper on Sunday by José Ángel Montañés. Basically the article confirmed that The Sagrada Familia never obtained planning permission for the building and that the land on which it’s built figures officially as an empty plot of land. The first plans for building on the site date back to 1886. The original architect was Francisco de Paula del Villar who planned to build a simple church. When he left the project one year after work had commenced in 1882, his place was taken by Antoni Gaudí who had grander plans. Although planning permission was sought, it was never approved. This isn’t really breaking news. Neither is the silence that the construction committee has maintained on the matter. It has always appeared to work on the assumption that it can carry on building regardless. What is news, to me anyway, is that the committee hasn’t sought approval of any kind for the building work that’s going on. In other words, they can build pretty much anything they want without anyone else’s say in the matter. Even when it was discovered that they’d built outside the designated plot area in 2007, no-one said anything. As the article points out, back in 1994, it was assumed that it would take 100 years to complete the building. That changed to 50 years in 2000 and now work is expected to be completed in 2026, thanks to new construction techniques and the 25 million euros that tourists invest in the building works each year. So isn’t it time something was done to sort out the paperwork? For those of us who live in the dark shadow of the Sagrada Familia, the article makes for depressing reading. As José Ángel points out in his conclusion, the decision-makers inside the committee only see one possible future – to demolish all the buildings that stand in the way of completing its project. And, chillingly, no-one seems prepared to do anything about it. One of the original features of the Beyond secondary course that I've been working on over the past couple of years can be found on the Speaking pages in each unit. All of the model conversations and situations on these pages are presented by a group of teenage drama students. There's a different group for each of the six levels and each group has 10 members, reflecting the ages of the students using the course. The drama group kids perform the scenes as if they're in a drama workshop with a few basic props. In fact, we've shot the videos at the Pegasus Theatre in Oxford, using the main stage as well as the studios and other parts of the building, giving the videos an authentic drama group feel. Teachers can use these videos in class or use the audio in class and encourage students to watch the videos at home. One of the main reasons for doing the videos in this way has been to reflect the classroom situation in which we often ask students to role-play scenes or read out conversations. In a way, we're asking our students to bring drama into the classroom as if in a drama workshop. So watching other kids trying to do the same task on video can really boost their confidence. This past week we filmed the videos for A2 level and the kids were fantastic. It's also been great working with Clark Wiseman and his team at Studio 8. Clark is really good at making the kids feel relaxed. It's not easy acting in front of several cameras with a sound recordist holding a boom microphone over your head, Macmillan editors telling you what to do (not to mention the course authors). It'll be really interesting to see how teachers and students react to these videos in the real world. Not long to wait! Derek Jacobi enters the Trafalgar Studio auditorium and takes his place in one of the house seats. I assume they're the house seats. Back in the days when I worked in the box office at the Shaw Theatre and Sadlers Wells, we always kept a group of seats for VIPs, friends of cast members, or customers who needed to be re-seated at the last moment. These were called 'house seats' and they were the best seats in the house. We're at the theatre now to see Henrik Ibsen's play Ghosts which was first performed back in 1882. It's still a powerful play today and I'd read in one review that the final five minutes of Richard Eyre's production were hard to watch. When I told this to my mother, she told me that she'd first been to see the play many years ago. She went with the musician Ivor Keys who she was going out with at the time. According to my mother, he'd fainted at the end of the play during those final minutes. Curiously, we almost didn't get to see the play because we both hadn't been feeling well beforehand. Maybe it was just the nerves, wondering how we'd react to those final few minutes. Inevitably the end couldn't live up to such expectations. It was odd to watch the actors taking their curtain call, unable to smile after performing such a bleak play (for the second time that day). There were more ghosts back at the hotel. I'd booked a room at the Pullman Hotel on Euston Road. This was long before I met up with the old friend I used to work with there when it was still the Shaw Theatre and St Pancras library (see An adventure in space and time below). When I checked in, the concierge asked me if I'd stayed there before, I wanted to say 'Well, yes, actually. I worked right where you're standing now long before you were born'. I spent many happy days there learning how to 'build a house' by placing audience members in the right seats on large seating plans. And never selling the house seats, of course. The Shaw Theatre seating plan as it is today. 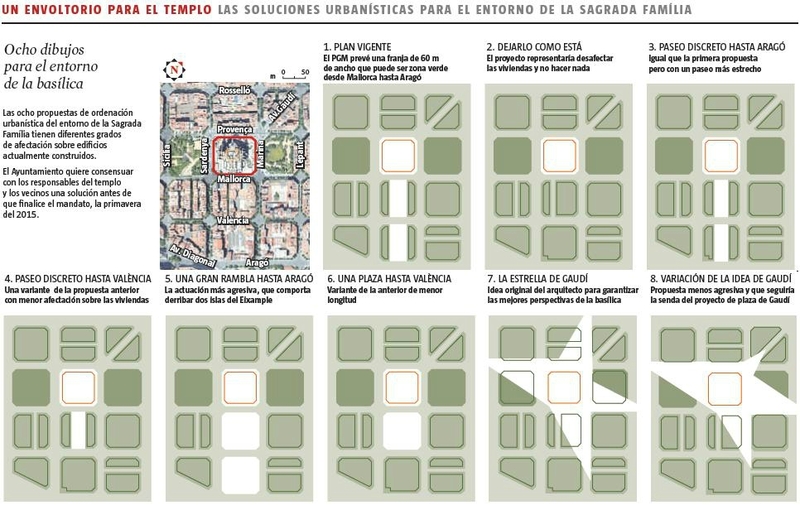 These are the plans that were published in La Vanguardia newspaper this week showing the different options being considered for the Sagrada Familia in Barcelona. The basilica is due to be completed in 2026 and the final phase of the construction includes building the main façade. Unfortunately, there's a block of buildings right in front of that façade. For years there have been rumours about what will happen to those buildings and to the people who live there but nothing has ever been confirmed. The plans from La Vanguardia. The options that appeared in La Vanguardia include pulling down two whole blocks to make way for the entrance, a park, an underground car park and a shopping arcade (option 5). There are several variations on the same idea including the option to leave things as they are (option 2 - not likely). The biggest surprise was seeing Gaudí's original (in both senses of the word) idea of creating a four-pointed star-shaped area around the basilica, allowing it to be seen from the most dramatic angles (option 7). The newspaper encouraged people to vote for their preferred option and on the first day a majority chose Gaudí's idea. The other amazing thing about Gaudí's idea is that it saves our flat from being demolished. Over the years, I've occasionally written letters to newspapers complaining about the way in which the construction of the Sagrada Familia has affected those of us who live in its shadow. The 'patronat' who oversee the building have never shown any interest in having a dialogue with their neighbours or in sharing their plans for the future. Judging from the work that's been done to the basilica over recent years, I doubt if Gaudí's wishes will be respected. The need to accommodate the tourists, souvenir shops and restaurants is bound to take preference. My brother-in-law, Michael Duncan, made the drawing below which neatly shows how our home is on the point of being devoured by the Sagrada Familiasoros. It'll be interesting to see when a representative of the Sagrada Familia will finally acknowledge that people have their homes here and have lived here for 30+ years. A cynic might think that they're waiting for us to abandon all hope... or die. Merry Christmas!